Guests will learn the basics of making infused cannabis (marijuana) oils, alcohol, and sweetners with a few key tips. We will review a short history of cannabis and learn about different preparations in different cultures. 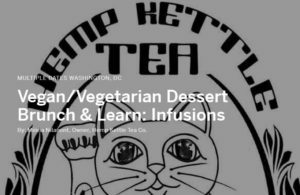 We will observe demos, drink teas, and enjoy some vegan/vegetarian desserts. These are one hour sessions and you can pick from 12pm, 1pm, and 2pm start times.